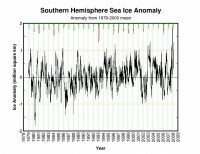 Last year when Antarctic set a new record for ice extent, it got no media attention. 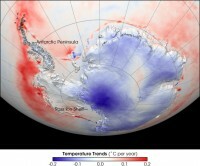 They focused on the north polar regions where the ice set record low levels. This summer when unprecedented anomalous cover continued in the Southern Hemisphere again no coverage. Then this report in the news today. You probably saw it on your favorite network or internet news site (pick one, anyone). A vast ice shelf hanging on by a thin strip looks to be the next chunk to break off from the Antarctic Peninsula, the latest sign of global warming’s impact on Earth’s southernmost continent. Scientists are shocked by the rapid change of events. Glaciologist Ted Scambos of the University of Colorado was monitoring satellite images of the Wilkins Ice Shelf and spotted a huge iceberg measuring 25 miles by 1.5 miles (37 square miles) that appeared to have broken away from the shelf. Scambos alerted colleagues at the British Antarctic Survey (BAS) that it looked like the entire ice shelf – about 6,180 square miles (about the size of Northern Ireland)- was at risk of collapsing. The region where the Wilkins Ice Shelf lies has experienced unprecedented warming in the past 50 years, with several ice shelves retreating in the past 30 years. Six of these ice shelves have collapsed completely: Prince Gustav Channel, Larsen Inlet, Larsen A, Larsen B, Wordie, Muller and the Jones Ice Shelf. See MSNBC version of this story here. Icecap Note: Let’s put this in perspective. 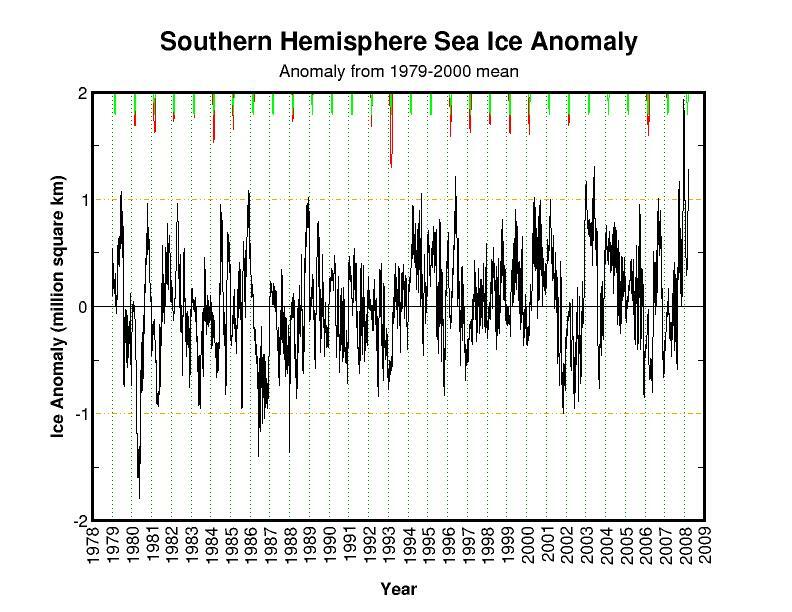 The account may be misinterpreted by some as the ice cap or a significant (vast) portion is collapsing. In reality it and all the former shelves that collapsed are small and most near the Antarctic peninsula which sticks well out from Antarctica into the currents and winds of the South Atlantic and lies in a tectonically active region with surface and subsurface active volcanic activity. 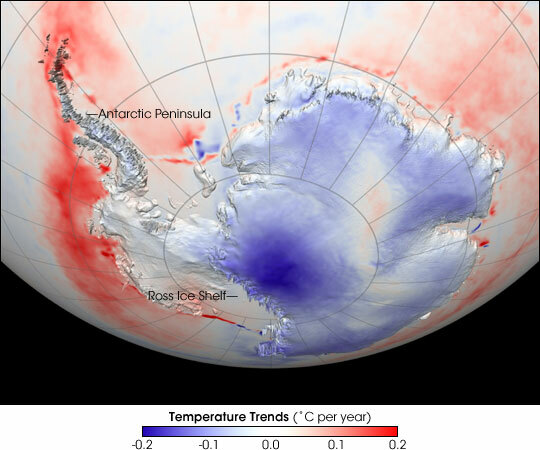 The vast continent has actually cooled since 1979. One Icecap reader points also to a paper (Glasser et al, 2008) identifying some of the other natural processes that can lead to these ice sheet breaks, in this case Larsen B.